The Best Collection of College, University Essays and Articles. 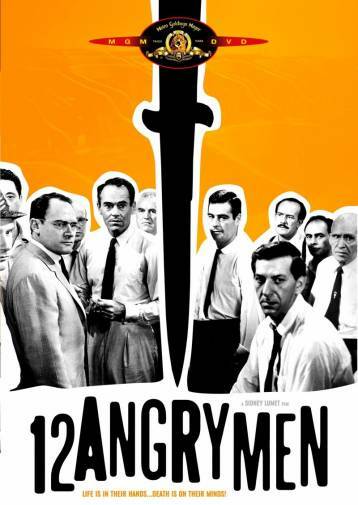 12 Angry Men (1957) is a gripping and an engrossing examination of 12 jurors who are deciding the fate of a young Puerto Rican boy in a murder trial. It is phenomenal that a movie with a running time of just 96 minutes and shot in just one room could be so impactful and so intellectually stimulating that it could be a source of immense learning for generations to come in the field of psychology, social psychology, Organizational Behavior anddecision making. In this paper, we will be exploring 3 wide dimensions/theories in the field of OB and their application in the movie by citing specific examples from the film. We will start off by exploring the phenomenon of Perception and Individual Decision Making where we would be exploring the decision making process at an individual level, explaining the underlying theories and biases involved in individual decision making and try to map those to specific instances in the film. This will be followed by a discussion on the phenomenon of Group Behavior with particular emphasis on group formation, group decision making and Groupthink. Finally, we will explore how Personality influences the decision making environment. One of the theories that were seen at play was Attribution Theory. Attribution theory is a phenomenon that is characterized by individuals observing behavior followed by an attempt to gauge whether the event was externally or internally caused where internal causes under the person’s control while external causes are not. For example, the architect made more external attributions to the boy’s behavior, citing that the boy had been slapped around all his life and was of the view that external attributions could not provoke something as grave as murder. On the contrary, the angry juror who ran the messenger service and was a distraught father made internal attributions about the boy’s behavior, reflecting that kids these days don’t respect their adults and have lost their sense of morality. Furthermore, the old loud mouthed bigot stubbornly advocated a guilty verdict just because the young boy was from a slum and hence his reasoning that all slum kids are inherently rotten; a classic case of stereotyping whereby judgments are made about the person just because he belongs to a particular group. One of the most startling observations in the film was the manifestation of fundamental attribution error. Fundamental attribution error refers to the tendency to underestimate the influence of external factors and overestimate the influence of internal factors when making judgments about the behavior of others. In simple words, we blame people first, not the situation. For example, the distraught father cited the boy’s shout “I’m gonna kill ya” as an indication of the boy’s murderous rage. However, when he was enticed by the architect later in a discussion after being called a sadist, he too shouts, “I’m gonna kill ya” but he does not really mean it. It was just the situation that elicited such a response. Similarly, the stock broker assumed that the boy’s inability to recall the movies he went to meant that he was lying and not that he may have not been able to recall it due to the situation, trauma and mental stress. The realization came, when he himself was not able to recall the movies he went to just a few days back even when he was not under any stress. A confirmation bias in decision making is referred to as selecting and using only facts that support our expectation and ignoring disconcerting facts. Since all but one of the jurors had an expectation of a guiltyverdict, they all confirmed their biases by continuously reiterating those same twisted facts that confirmed their expectations and nobody but one stopped to question. As a result of this bias, they genuinely overlooked certain pieces of information that would have caused confusion and chaos in their minds. For example, they did not realize that the old man was walking with a limp and thus he could not have reached the door in a mere 15 seconds. Secondly, they failed to see the marks on the old woman’s eyes who testified to have seen the killing. Thirdly, that the knife that was used for the killing was not all that unusual and finally, that it would have been impossible for anybody to hear, “I’m gonna kill ya” at the same time as a noisy L train was passing by. It is interesting to note that the five stages of Group Development Model can be quite clearly captured in this film. In the first stage that is of forming members feel much uncertainty. This uncertainty was evident up until the first vote when all the jurors were trying to get to know each other and trying to ascertain how the others felt about the case. For example, the angry man who ran a messenger service had first interacted with the timid bank clerk and had expressed his frustration over how the lawyers would keep on talking and talking on an “open and sure case like this”. There was an air of uncertainty even when Mr. Foreman was ascertaining a seating arrangement and the loud mouthed bigot questioned as to what difference it made. In the second stage that is storming, there are lots of conflicts between group members. This was seen from the first vote which resulted in an 11:1 in favor of guilty to a 10:2 vote after which the other members started to shrug of the environment of forced conformity and genuinely were interested in discussing further. During the storming stage, many conflicts arose such as the argument between the loud mouthed garage owner and the guy from the slum and then Mr. Foreman getting upset how irreverent the garage owner was in his effort to try and keep things organized. In the norming stage, members have developed close relationships and cohesiveness. This was seen from the 10:2 vote to a 6:6 vote when members chose to identify themselves closely with the members who were supporting their decision. It started when the architect gambled for support by calling for a vote through secret ballot. In the performing stage, the group becomes fully functional. This was seen from a 6:6 vote all the way till a unanimous “not guilty” verdict. This period was characterized by clear argumentation from both sides, save a few instances such as the unreasonable change of vote by the baseball fan and the ridiculous shouting by the garage owner. The architect was making clear and consistent arguments and casting a clear doubt in the testimonies of each of the witnesses and being supported by others who favored a “not guilty” verdict such as the old man who very astutely identified the marks on the woman’s nose who testified to have seen the actual killing. One of the most important aspects of group behavior that is depicted in this film is the idea of Groupthink and Groupshift. Groupthink is depicted in situations where group pressures for conformity deter the group from critically appraising unusual, minority and unpopular views. When the initial vote was taken public, several jurors, who later expressed the uncertainty over a guilty verdict, chose to comply with the group in an effort to confirm to the majority and the architect was the lone man standing. For example, it seemed as if the guy from the slum was unsure and he did not say much but just went with the majority at the beginning. Furthermore, the old man also initially confirmed with the group but switched when the vote was private and finally the baseball fan very blatantly went along with the majority or the dominating group which was seen when he changed his vote to “not guilty” just to break the deadlock and because the “not guilty” group was gradually getting stronger. Groupshiftoccurs when discussing a given set of alternatives and arriving at a solution, group members tend to exaggerate the initial positions that they hold. This causes a shift to a more conservative or a more risky behavior. This was seen when the angry, distraught father brought in his prejudices about teenagers in general which was followed by seemingly vindicating facts highlighted by the astute stock broker further pushed the group towards a risky “guilty” verdict. Even the architect came under pressure and agreed to comply if everyone voted “guilty” by a secret ballot. The personality of the architect is particularly of interest. One of the attributes that he demonstrated was consistency which encompasses loyalty to a particular idea. Throughout the film, he always remained consistent in his opposition to the majority which essentially made other question their judgment. For example, the old man changed his vote simply because he felt that if someone is defending his vote with such conviction, then he may have some important points to make. He also scored high on agreeableness because he was good-natured, cooperative and trusting and did not appear rigid. For example, he pointed that he didn’t necessarily think that the majority was wrong. He just wanted to talk more about it which showed that he was consistent, yet open minded. He also scored high in emotional stability because he was calm, self-confident and secure under stress. It is difficult to remain calm and cool under a stress offered by personalities like the astute stock broker, the loud mouthed garage owner and the angry man who ran a messenger service. His counterpart and the antagonist scored relatively low on emotional stability simply because he lost his temper on a lot of occasions which swayed the group against him. For example, in his emotionally unstable state, he wrongly accused the guy from the slum for changing after a “golden voice starts preaching”. Moreover, he started to bring his own downfall when he said things in an emotional burst such as when he himself concedes that the witness was an old man and couldn’t have been positive about anything. And then when he was enticed by the architect himself, he shouted, “I’m gonna kill ya” and hence disproved his own arguments about how this very statement could actually lead to murder. The architect also scored high on conscientiousness because he was responsible, dependent, persistent and organized. He would look at each testimony and very make a conscious effort to investigate the little details for any evidence of inconsistency that would lead others to have a reasonable doubt in their minds. For example, he ordered the blueprint of the old man’s house and emulated his limping walk to the door the exact distance so see if the old man could really reach the front door in 15 seconds. The application of the following three areas of organizational behavior helps us to give an academic bent to the film and helps us appreciate the true genius behind a 1957 drama film. Is This Website Helpful To You?